When Jim and I were first getting started in the full-time RV lifestyle, we wanted to bring a few things with us that would add our personality to the 5th Wheel. We knew we were limited in terms of space and locations to display these items, so he and I had to be selective. As I was walking through the RV yesterday, I saw these items and decided I’d like to share what we brought with us and why these items are significant. Jim and I enjoy color. The art work we own may not be of great value, but all the pieces either have special significance to us or bring us joy because of the colors. 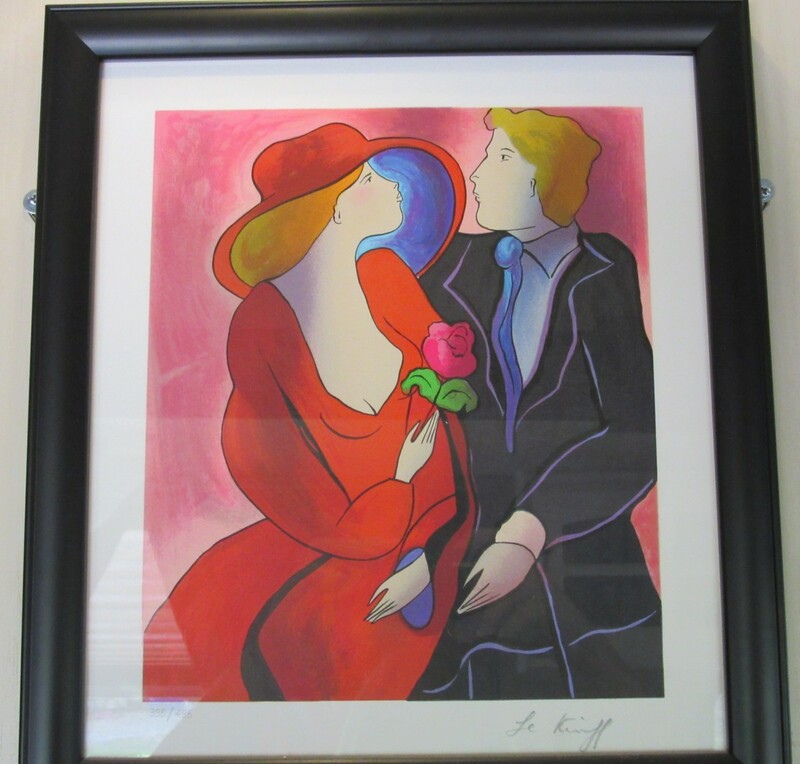 He and I felt that we could only really bring about two pieces of our art collection with us – two smaller pieces. 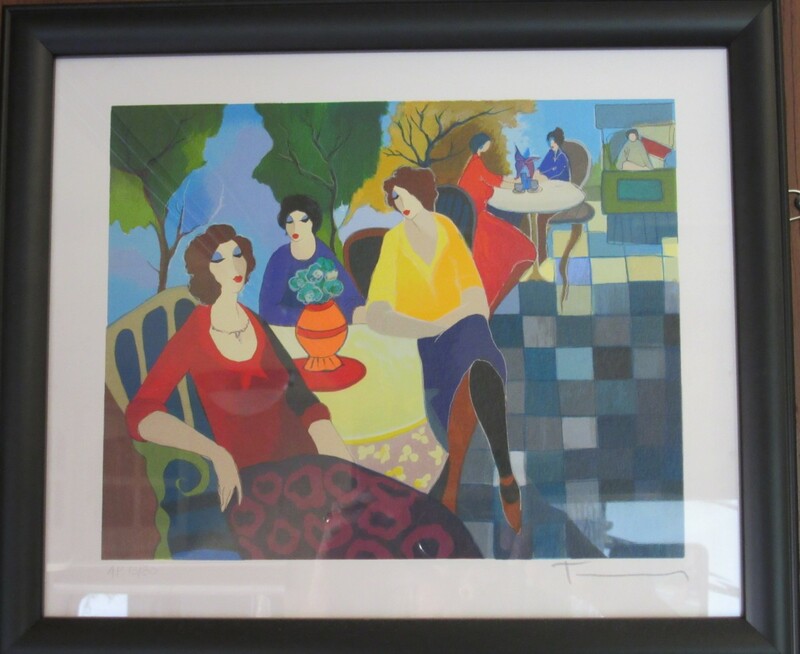 We chose one print by Itzchak (Issac) Tarkay and one small print by French artist Linda Le Kinff because of the bold colors we so enjoy. Also, these prints would fit in the limited wall space available to us in the camper. They are placed where they can be seen in both the living and dining areas of the 5th Wheel. We have with us 5 x 7 pictures our all of our immediate family, and the plan was to attach them to the available wall space in the bedroom using Velcro. We put up one as a test, and it managed to stay up about six weeks before it fell. We’ve not give up on this idea; we just haven’t perfected it yet. 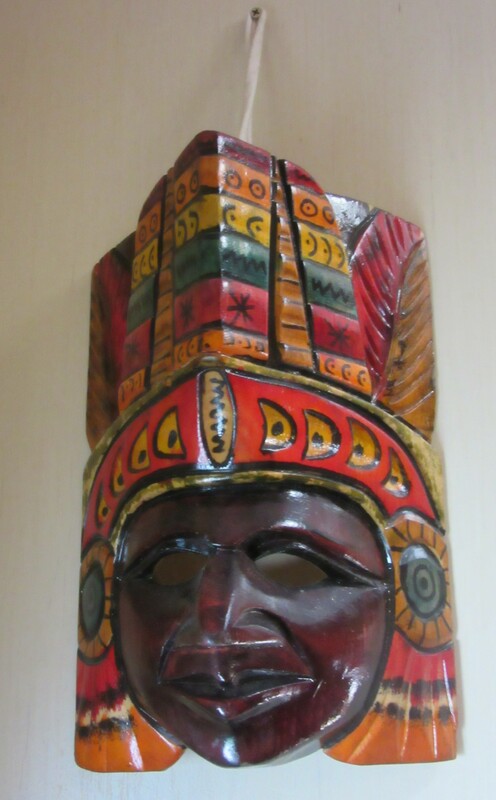 The next thing we selected to travel with us in the RV was a wooden mask replica of the Mayan god of travel, Q’uq’umatz, which Jim and I purchased in 2011 in Belize near the entrance into the Mayan ruin Xunantunich. We thought that having a “travel god” along with us for the ride was appropriate, and this fellow hangs on the side of the cabinet next to the door of the camper..
Then, there were several small items we wanted to bring along with us, and Jim and I decided that, while parked, they could set on top of our linen closet in the hall. In the picture below, that is exactly where they stay in the RV. We (me in particular) love dogs, and Jim’s mom knew this to be true. One year she gave me two “mail dogs,” and we used them. Only one could come on the road with us, so this is our “mail” dog. To the right of “mail” dog is Koyemsi, or Mudhead Kachina, of the Hopi Native American tribe. Mudhead was purchased on our Route 66 trip in 2014 in Navajo, Arizona. Unlike most Kachinas, Mudhead is not limited in where he can go and with whom he can socialize, so he seemed to be a good fit for travel lovers. To the right of Mudhead is our Key West chicken, which was purchased in Key West, Florida, in 2007 and has no name other than “Chicken.” As far as I know, at the time of this writing, there is (and has been) a law in Key West that prohibits killing chickens on the island, and its history relates to past Voodoo practices. (If you want to read an informative and entertaining article about chickens in Key West, click here.) 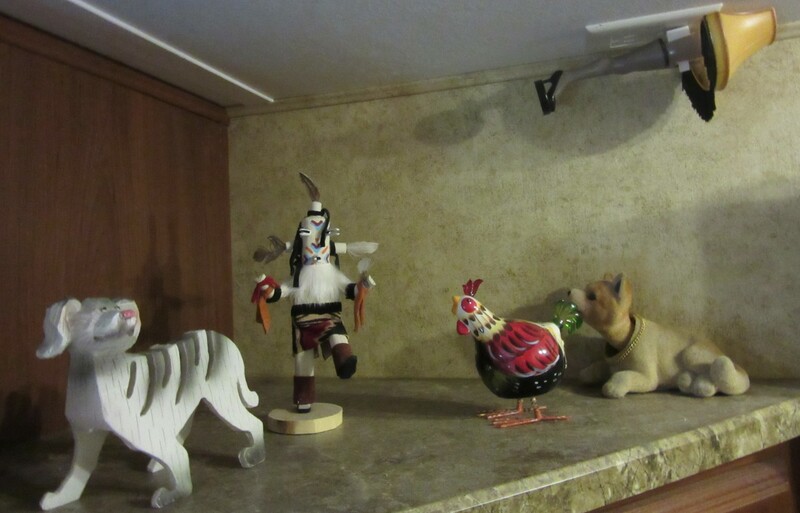 Next to the chicken is our bobble head dog, Cotulla, purchased during our day trip into Mexico in 2006. Jim named him after a Texas town located between San Antonio and the Mexican border at Laredo. Finally, plugged into an outlet above the linen closet is a night light made to resemble the leg lamp from the infamous (or famous, depending on your position) Christmas movie A Christmas Story. This was a Christmas gift to Jim one year from his mom, and it is just too Jim’s family to leave such a good night light behind. Now, you’ve had a glimpse into our personalities and things that have significance to us. One of the things about living the RV lifestyle is that one must narrow down the possessions that travel in the RV, so things of importance and personal value must be chosen.